Mega Fortune Progressive Jackpot Slot - How to Play and Win? In 2009 NetEnt launched the Mega Fortune Progressive Jackpot Slot, and it became popular very quickly. This video slot is based on a luxury theme and it includes white limousines, watches, expensive rings, dollar bills, cigars and cognac. 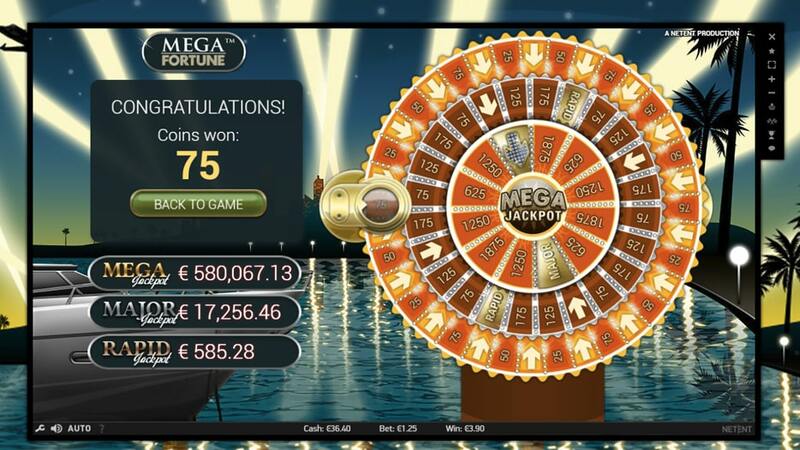 While playing Mega Fortune you will be able to win one out of three Jackpots; the Rapid, .. 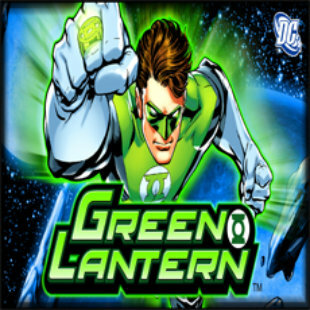 In 2009 NetEnt launched the Mega Fortune Progressive Jackpot Slot, and it became popular very quickly. This video slot is based on a luxury theme and it includes white limousines, watches, expensive rings, dollar bills, cigars and cognac. While playing Mega Fortune you will be able to win one out of three Jackpots; the Rapid, Major and Mega Jackpot. Simply land three Bonus symbols on a payline and spin the wheel. While spinning the wheel you can win a coin prize or continue to the inner circle of the Wheel. The further you go, the better the prizes will be! And when you get lucky you will win one of the Jackpots. And these Jackpots can be life chancing. Did you now the Mega Jackpot pays an average prize of 4 million euros? And did you know the highest Jackpot ever was 17,8 million euros? Ready to try your luck on this amazing slot? Then sign up at one of the reliable casinos we have listed below! Curious and ready to try out this amazing video slot? Then sign up your free account at one of the online casinos we have listed in the table below. All these online casino are tested by our team, reliable and safe. Join Betway to join the online casino that paid out the highest online Jackpot ever (17,8 million euros). Or join on of the other safe online casinos. All these casinos offer a nice portfolio of Jackpot Slots. Besides that some of them offer a exciting Live Casino and a Sportsbook. Want to have a look at the full game portfolio of an online casino? Then sign up your free account! 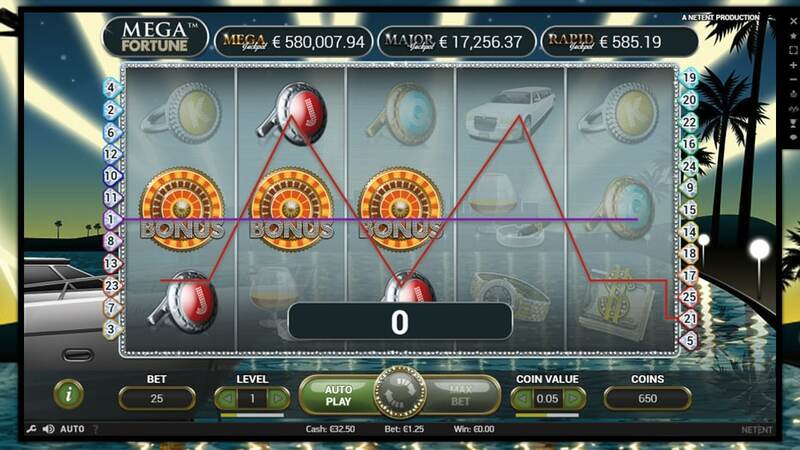 While playing the Mega Fortune Progressive Jackpot Slot you can bet between 1 and 4 coins per payline. The slot offers a total of 25 paylines for you to bet on. This means you will bet a total of 25, 50, 75 or 100 coins per spin. Depending on the coin value you have set you will be able to bet between €0,25 and €50,00 per spin. The minimum coin value is set a €0,01 and the maximum is set at €0,50. When you place higher bets, your chance of winning the Jackpot will increase. The chance of winning the Jackpot correlates positively with the Jackpot size and your size. Although this is the case you can also win the highest Jackpot with only a €0,25 bet (this happened with the highest Jackpot ever). Once you have set the right bet with the bet level and coin value you can set some other settings. If you want to play quicker you can decide to activate the Quickspin option. 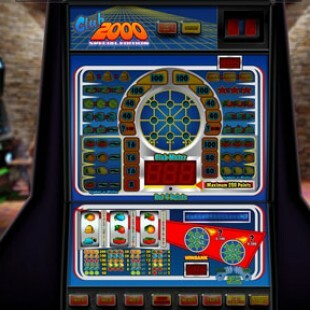 This makes the slot spin faster which ensures you can enjoy more spins in the same time. Besides this option you can set the Spacebar in order to spin the slot. This might also be easier when playing for a long time. Besides these options the Mega Fortune Progressive Jackpot Slot also offers a autoplay function. With this function you can let the slot spin without clicking. You can set between 10 and 1.000 auto-plays. If you like you can also use the advanced setting to let the slot stop at a certain point. You can for example let the slot stop when you won Free Spins or a Bonus Game. It’s also possible to set a certain single win or total loss in order to stop the slot. 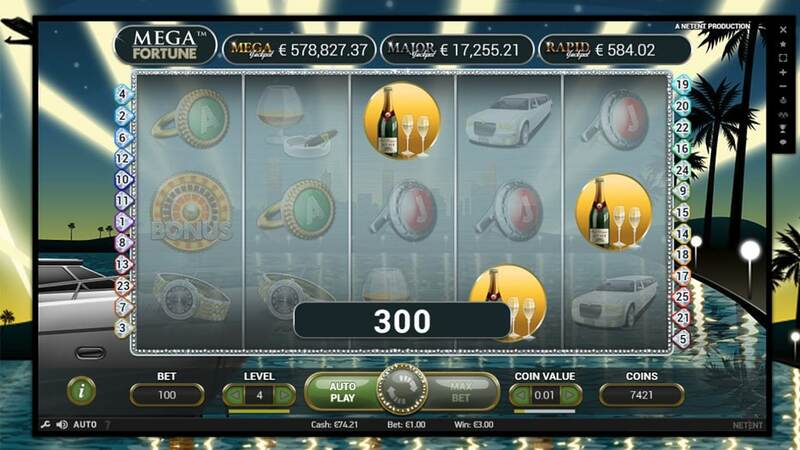 The Mega Fortune Slot is filled with luxury symbols. Line up three or more of the same symbols in order to win coins. The lowest paying symbols are the green and blue rings and the yellow and red cufflinks. Higher paying symbols are the glass with cigar, the dollar bills and the expensive watch. They pay up to 500 coins when lining up five of them. The best paying symbol is the white limousine, it pay a total of 1.000 coins when you line up five of them. The Mega Fortune Progressive Jackpot Slot also features Wilds. The Wild symbol is represented by a shiny boat. The Wild symbol substitutes for all other symbols accept the Bonus symbol and the Scatter. When you line up multiple Wilds in the slot you will be able to win some decent prizes. When you land three or more Scatters you will unlock the Free Spins Bonus. The first will start with a choice, you will need to pick one of the Scatters. Which Scatter you pick will determine how much Free Spins you will be awarded with, and how high the multiplier is. In most cases the amount of spins will be higher when you have a low multiplier. When you have a high multiplier, the amount of spins will be lower. I picked one of the Scatter and got 8 Free Spins at a x3 Multiplier. That’s pretty interesting if you land one good spin. In the end I won a total of €32,40 with a €1,- bet. This is not very good, but I could be worse. 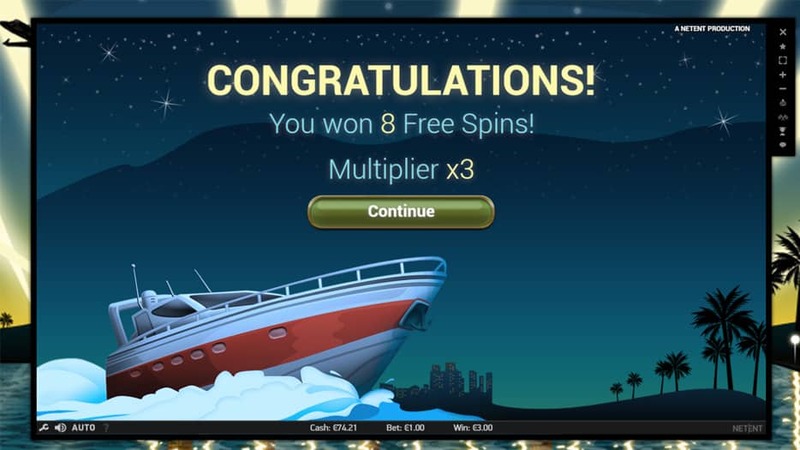 Tip: If you land two or more Scatters during your Free Spins you will win additional Free Spins or your multiplier will increase. Landing two or more Scatter one or more times can really increase your chances of winning big during the Free Spins Feature. Because of this coin prize your chance of winning is a bit better. Ready to win big? Then you will need to unlock the bonus game. You can do this by lining up at least 3 Bonus Symbols on one payline. Once do the game will get you to the Bonus Wheel. Spin this wheel in order to see what you win. Do you land on a number? Then you will win that amount of coins. Do you land on an arrow? Then you will continue to the next ring of the Bonus Wheel. And the further you get to the inner circle, the better the prizes will be. When you land three arrows in a row you will win the Mega Jackpot. You can win the other Jackpot on the second and third circle. If you get to the inner circle the coin prize will also be a lot better. Good luck and have fun with this unique feature! Although most Progressive Jackpot Slots don’t pay that well during the base game this game feels different. 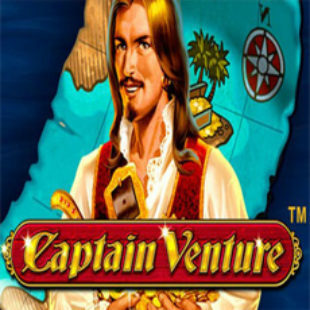 While playing this game you can win decent wins during the regular game and by unlocking the Free Spins Feature. Besides that you can win extra prizes with two or more Scatters. Because of this I think this game is more fun to play then most Jackpot Slots. Although this is the case Mega Fortune still offers some amazing Jackpots. Especially the Mega Jackpot can be life chancing. Looking for a fun and exciting Jackpot Slot? 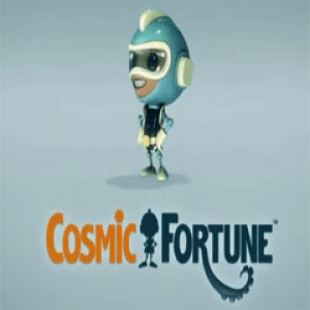 Then Mega Fortune might be a good choice for you! Want to learn more about the best Progressive Jackpot slots of this moment? Then continue reading on this page!